As everyone knows, the best part of the NFL season is when the league gets the chance to add rules and bylaws to an already-impenetrable rulebook. 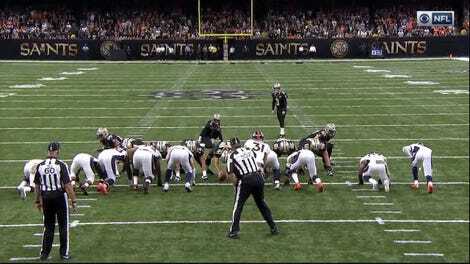 One of the new additions is a ban on players jumping over linemen to block field goal kicks. NFLPA president and Bengals OT Eric Winston said earlier this month that the practice was “a really dangerous play for everybody,” because the jumper could trip and hurt himself—although there aren’t any notable instances of this happening—while the line of the kicking team, specifically the snapper, is in a vulnerable position and could be hurt by a poorly timed jump. The league and players’ union both supported the ban, although Seahawks defenders Bobby Wagner and Kam Chancellor, two players who would be doing the jumping, weren’t so keen on it. The strategy wasn’t successful often anyway; only three kicks were blocked by a hurdling defender in 2016, according to NFL Research. The play itself also seems like a minor issue in which players don’t get injured often, because not every team’s 11th man was bold or athletic enough to try it, but whatever gives the impression that football’s safer, I guess. All of the new changes can be found below. No. 14 seems like an attempt at preventing the Polish Goalline defense. 8. By Competition Committee; Makes permanent the rule that disqualifies a player who is penalized twice in one game for certain types of unsportsmanlike conduct fouls. 9. By Competition Committee; Changes the spot of the next snap after a touchback resulting from a free kick to the 25-yard line for one year only. 11. By Competition Committee; Gives a receiver running a pass route defenseless player protection. 12. By Competition Committee; Makes crackback blocks prohibited by a backfield player who is in motion, even if he is not more than two yards outside the tackle when the ball is snapped. 13. By Competition Committee; Replaces the sideline replay monitor with a hand-held device and authorizes designated members of the Officiating department to make the final decision on replay reviews. 14. By Competition Committee; Makes it Unsportsmanlike Conduct to commit multiple fouls during the same down designed to manipulate the game clock. 15. By Competition Committee; Makes actions to conserve time illegal after the two-minute warning of either half. 4. By Competition Committee; Liberalizes rules for timing, testing, and administering physical examinations to draft-eligible players at a club’s facility for one year only. 5. By Competition Committee; Changes the procedures for returning a player on Reserve/Physically Unable to Perform or Reserve/Non-Football Injury or Illness to the Active List to be similar to those for returning a player that was Designated for Return. 6. By Competition Committee; The League office will transmit a Personnel Notice to clubs on Sundays during training camp and preseason.